The maximum dimensions cannot exceed any of the following measurements: 22" long x 14" wide x 9" tall or 115cm (56 x 36 x 23 cm). All carry-on items should be stowed in an overhead bin. Personal item - includes: purse, briefcase, laptop bag OR a similar item such as a tote that does not exceed 36 inches( length+width+height) and must fit under the seat in front of you. The maximum dimensions for a carry-on bag are 14 inches x 9 inches x 22 inches (35 cm x 22 cm x 56 cm), including handles and wheels. 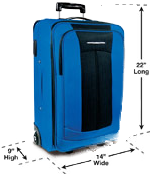 Southwest Airlines limits carryon bag dimensions to 10 x 16 x 24 inches.